How to add a new policy to an existing Knox service. On the Service Manager page, select an existing service under Knox. The List of Policies page appears. The Create Policy page appears. Policy Name Enter an appropriate policy name. This name cannot be duplicated across the system. This field is mandatory. Knox Topology Enter an appropriate Topology Name. Knox Service Enter an appropriate Service Name. Description (Optional) Describe the purpose of the policy. Audit Logging Specify whether this policy is audited. (De-select to disable auditing). Policy Label Specify a label for this policy. You can search reports and filter policies based on these labels. Specify the group to which this policy applies. 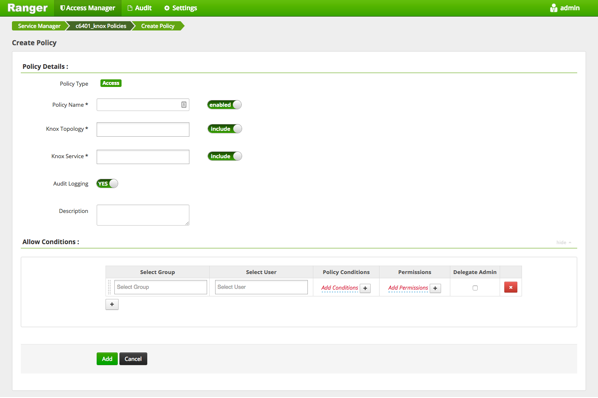 To designate the group as an Administrator for the chosen resource, specify Admin permissions. (Administrators can create child policies based on existing policies). The public group contains all users, so granting access to the public group grants access to all users. Select User Specify a particular user to which this policy applies (outside of an already-specified group) OR designate a particular user as Admin for this policy. (Administrators can create child policies based on existing policies). Permissions Add or edit permissions: Read, Write, Create, Admin, Select/Deselect All. Delegate Admin When a policy is assigned to a user or a group of users those users become the delegated admin. The delegated admin can update, delete the policies. It can also create child policies based on the original policy (base policy). Since Knox does not provide a command line methodology for assigning privileges or roles to users, the User and Group Permissions portion of the Knox Create Policy form is especially important. You can use the Plus (+) symbol to add additional conditions. Conditions are evaluated in the order listed in the policy. The condition at the top of the list is applied first, then the second, then the third, and so on.